Anak si Hamid: Damned if you do, damned if you don't - Malaysia's dilemma. Damned if you do, damned if you don't - Malaysia's dilemma. The spectacle of 'boat-people' stranded in the Andaman Sea brought on a sense of deja vu from 40 years ago. In 1975, the Viet Cong defeat of the Americans led to an exodus of South Vietnamese 'collaborators' and 'sympathizers' to the United States - initially mainly the well-educated and wealthy Vietnamese - totalling about 125,000. On that journey thousands died as a result of water and food shortages, of drownings and attacks from pirates. The survivors landed in Malaysia, Indonesia, the Philippines and Hong Kong. Malaysia bore the brunt, because the Peninsula was the boat people's 'first line of approach'. The east coast states of Trengganu, Kelantan and Pahang, - the poorest states of the Peninsula - were deluged by flotillas of 'boat-people' landing on their shores. 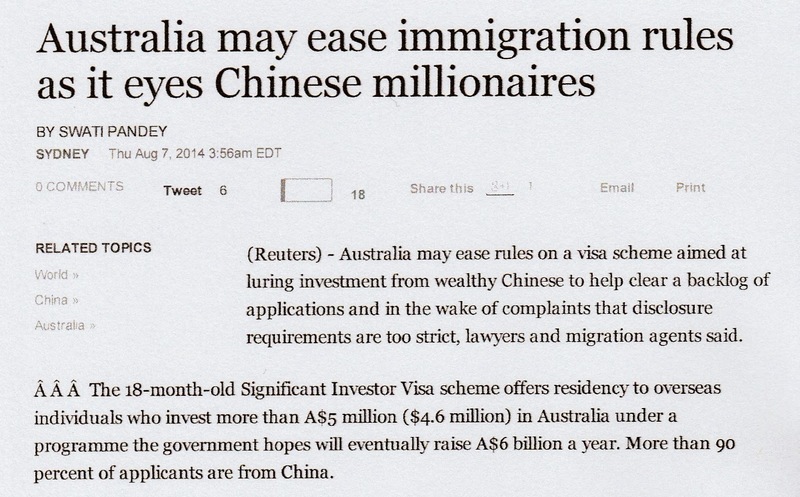 The boat people were coming at the rate of 65,000 a month. While Thailand was able to send Cambodian refugees escaping Pol Pot's regime back into their homeland, Malaysia had no such option, she had no common land border with Vietnam or Cambodia. The boat people who first landed in 1978 created a 'crisis problem' of 20 years for Malaysia. Malaysia was designated as a 'nation of first asylum', Refugee camps for Vietnamese and Cambodians were set up in Pulau Bidong (with 42,000). "By the time Bidong was closed as a refugee camp on 30 October 1991, about 250,000 Vietnamese had passed through or resided in the camp " (Wikipedia). Other camps were located at Sungai Besi (1975-1996) and Pulau Tengah. On the departure of the refugees in 1981, Pulau Tengah, - endowed with beautiful reefs and where leatherback turtles lay their eggs - was declared a marine park. According to Bram Steen, UNHCR Malaysia, 240,000 Vietnamese refugees from Malaysia had been resettled in third countries and 9,000 others opted to return to Vietnam'. While Malaysia was stretching over backwards to provide transit camps for the refugees, she also co-operated with the UNHCR to facilitate their repatriation to third countries like USA, Canada, Australia, New Zealand, UK and even Israel. This task took nearly 20 years. It was not smooth sailing for Malaysia. The bouquets went to the receiving Western countries. The brickbats were reserved for Malaysia - and especially from Australia. The latter even made a movie to castigate Malaysia's attitude towards the boat people. 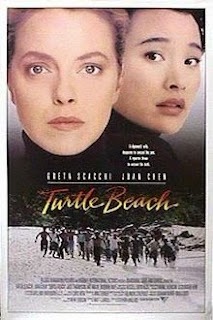 I refer to the movie Turtle Beach (1992). I suppose those who were just "twinkles in their fathers' eyes" during that period know little or nowt about the social and political problems that Malaysia had to deal with in being the "nation of first asylum" - including the self- righteous and hypocritical whining of the British and Australians. When people opt to migrate, to leave their homeland for another, two factors are involved - "push" and "pull". One could say that Chinese immigration from 150 years ago into Malaya and Singapore was based on the the push factor of escaping poverty and the aftermath of wars in China. Unlike present day refugees from Afghanistan, African states south of the Sahara, Iraq and Syria, immigrants from China had an easier rite of entry. They were needed and welcomed by the British Imperial authority who enabled and encouraged them to start a new life in the Semenanjung and Singapore with the option of returning home whenever they felt like doing so. 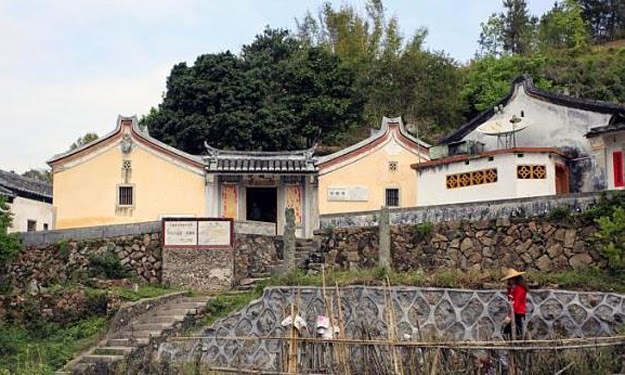 Zhonghandi - The late Mr Lee Kuan Yew's ancestral home in Guangdong Province built by his great-grandfather Li Muwen in 1884 with money he had earned in Singapore. From Malayan Reader Book 3 - a scene from the 1920s to 1940s. The moral is obvious. 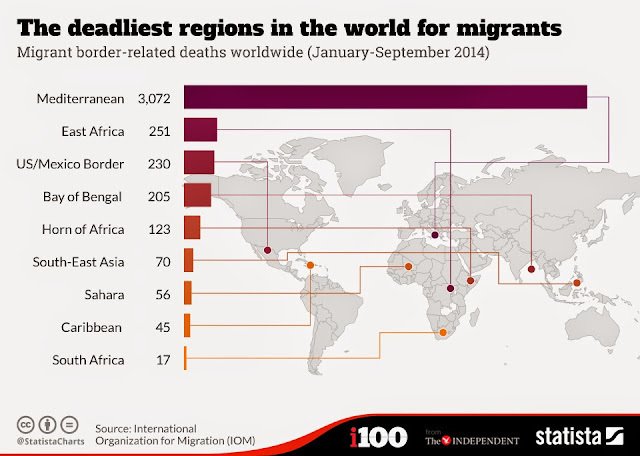 Malaya - and Malaysia - have an honourable history of taking in migrants. 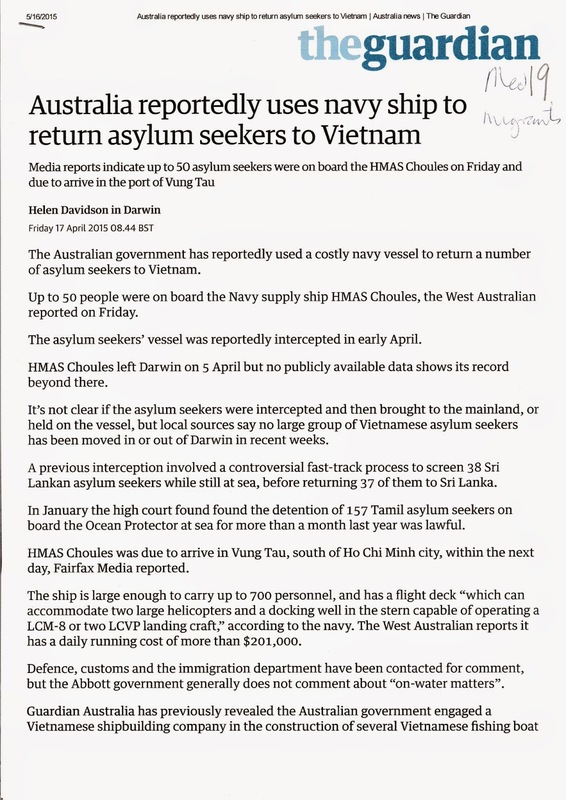 Which brings us to the most recent case of "boat people" on Malaysian shores. In this case, a clear demarcation must be made between economic migrants from Bangla Desh ("pull") and political refugees from Myanmar ("push"). According to a UNHCR statement on 17 May, only 400 of the 1,000 boat people who landed in Langkawi waters were Rohingya refugees. The status of the Rohingyas as political refugees is clear cut. Boat people from Bangla Desh, however, are a very different matter. If they want to work in Malaysia or Thailand or Indonesia they, unlike the Rohingyas, have the facility and the means to apply through the proper channels like many of their kinsmen in Malaysia. According to an article in The Australian (11 May 2011) : "The Rohingya .... are the second largest group from Burma to flee to Malaysia. Denied full citizenship, education and travel rights in their native state, where they are routinely harried and harassed, there is little they can do to improve their lot bar leaving their homes for an unsure reception elsewhere. Refugees International claimed ..... the Rohingya were one of the most persecuted groups in the world. At least 200,000 have fled from Burma to neighbouring Bangla Desh, where only about one-tenth are recognised as refugees by Bangladesh's government and where most live in squalor. What are Malaysia's options? Malaysia is already 'home' to more than 90,000 refugees and asylum seekers, mostly the mistreated Christian Chins and the even more persecuted Muslim Rohingyas. There are the others like those from Afghanistan, Iraq, Somalia and Sri Lanka. Besides these numbers, there are an estimated (a conservative one) 1.5 million people who are "undocumented migrants" mainly labourers from Indonesia. 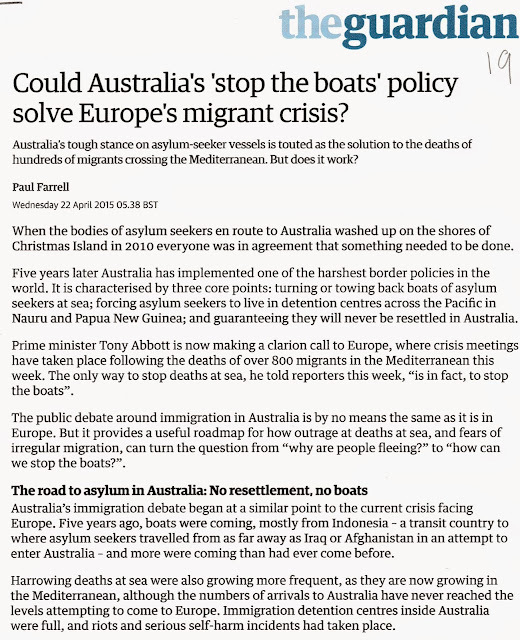 Furthermore : "The Canberra government, which is determined to prevent asylum-seekers from arriving on its shores by boat after a hazardous journey across the Indian Ocean, has warned the protestors they will never be allowed to live in Australia. Peter Dutton the new Australian Immigration Minister reiterated that there would be 'no softening of Australian policy', that the government maintains 'absolute resolve' that such refugees would 'never arrive in Australia'. For Malaysia, then, it is a double damnation: damned if you do, damned if you don't. The Malaysian dilemma needs to be analysed in terms of the larger context, of the global displacement of people by wars, poverty and extremism. Malaysia only needs to observe how the Christian-Caucasian founts of human rights deal with the problem. 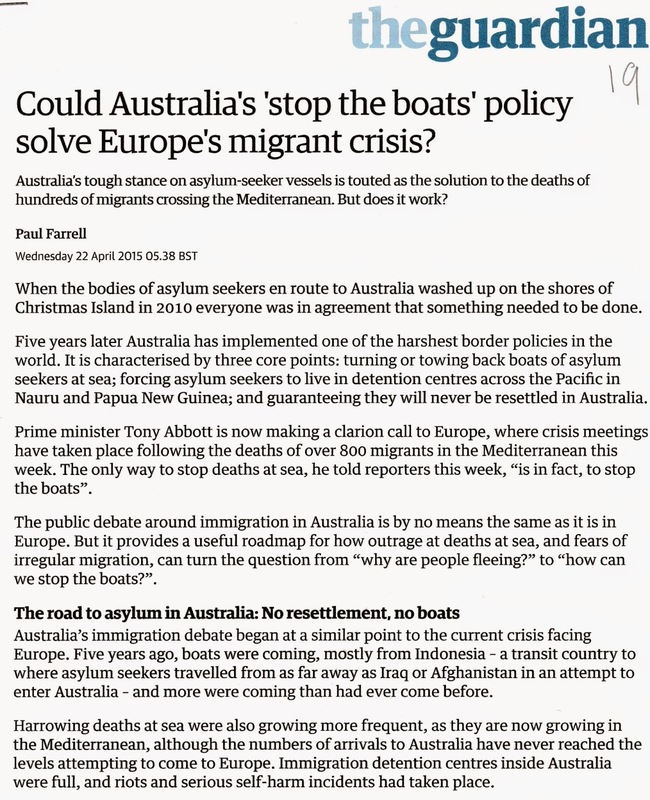 Our bleeding heart defenders of human rights - always so quick to follow Western strictures against Malaysia - could learn a little from European, Australian and North American policy and resolutions with regard to migrants - and especially the boat people problem. They cannot expect Malaysia to be "whiter than white', so to speak. BUT, there is one stark difference between the plight of the Mediterranean boat people and the one in Southeast Asia. The former is almost entirely the making of the western world - the political and economic breakdown of the African states, the War on Terror in the Muslim Middle East and the pursuit of the Arab Spring in Libya. It's a case of "the chickens coming home to roost". However, the main perpetrator of this chaos, the USA has somehow been cushioned from facing culpability. In the case of the Rohingyas, Malaysia, Thailand and Indonesia bear no responsibility. The crisis is entirely the creation of Myanmar's extremist political and religious policy. Those crusaders for elections and a government based on human rights in Myanmar, celebrities like Aung San Suu Kyi should be persuaded to now turn their liberal intentions to stopping the persecution of the Rohingyas. 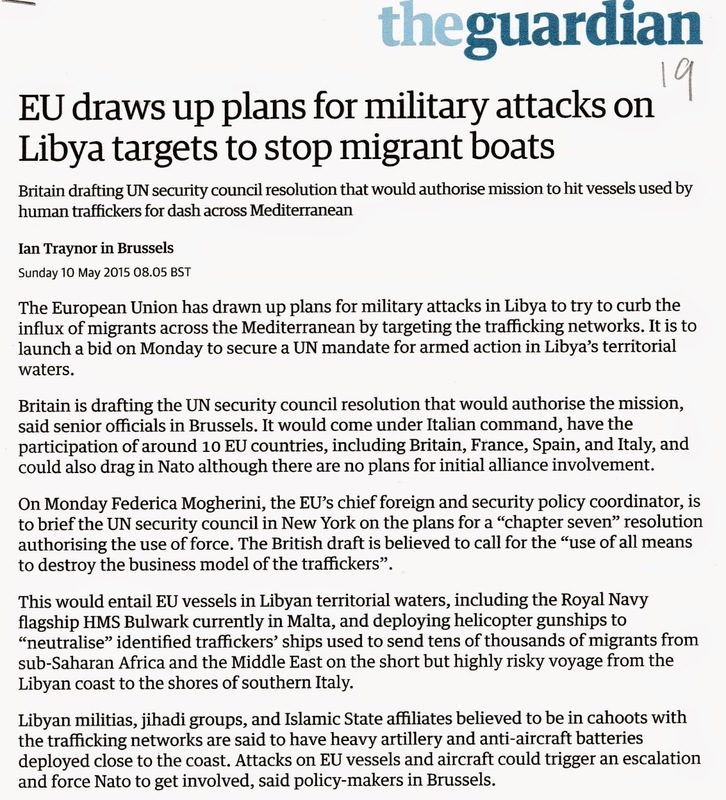 Another brain wave, this time from the European Union. In the past week or so, the print and electronic media in UK have been giving a lot of publicity to the boat-people in the Andaman Sea, as they have with the situation in the Mediterranean. But embedded in it is a touch of giving Malaysia a 'ticking off ' - almost a re-hash of the criticisms made by Malaysia's human rights brigade. As a matter of interest, Christian Chins from Myanmar who are stuck in a "ghetto of sorts in Kuala Lumpur's Imbi district" can draw hope from the success of their fellow-Christian Myanmar refugees, the Karens. They (170 Karens ) are happily settled in a small town ( population 2,300) in Victoria (Australia) where they contribute $41m benefit to the local economy working at a local poultry producer Luv-a-Duck. 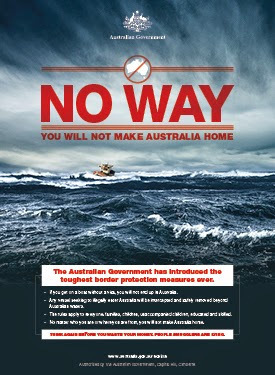 Australia has this warning for immigrant hopefuls from Afghanistan, Sri Lanka, Syria etc. But there's hope for a select group of people. And the British Government (ever ready to learn from Australia?) has just announced exactly the same policy. 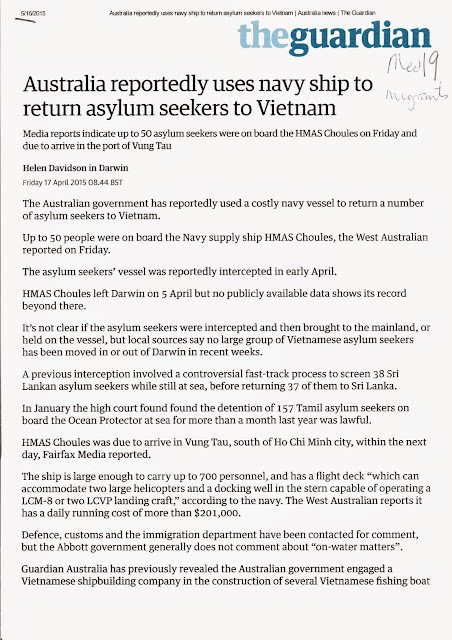 Forty years ago, when Malaysia had to provide refugee camps for Vietnamese boat people, they fought and got the assurance from western countries that these refugees will be repatriated to third countries and/or return to Vietnam. The Myanmar government have denied any responsibility. It is obvious that 'third party' countries that are richer than Malaysia will not offer asylum to the Rohingyas. 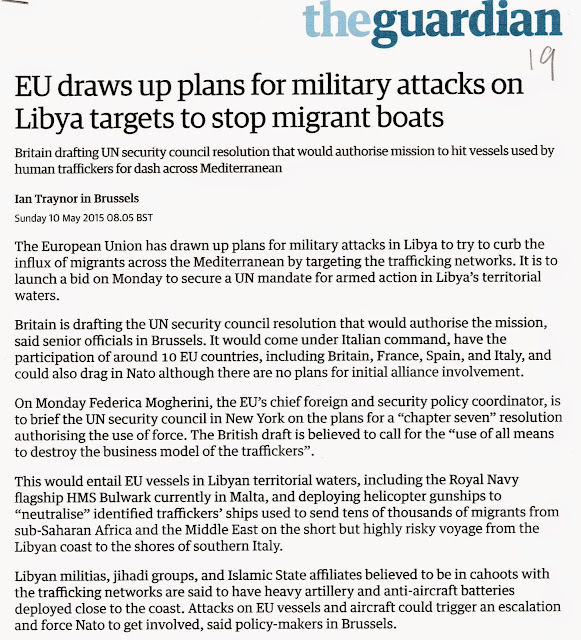 They are all suffering from 'compassion fatigue' - they just have too much "collateral damage" to deal with - and the EC is well on the way to turning itself into Fortress Europe. Above all, Malaysia still has to sort out their present problem of over 1.5 million refugees, asylum seekers and illegal migrant workers!! Whatever suggestions are made by these experts and other pontificators; some people, some organisations, some countries will have to put their money where their mouth is. As I am writing this, I am in Tawau,Sabah.We have more illegal than legal migrants here.Contrary to what has been rumoured in the media, it is extremely difficult to acquire Malaysian citizenship here, even for those migrants who are third generation, born and bred in Malaysia, whose only language is Bahasa Malaysia.Malaysia has given them a peaceful place to stay, away from the 'fighting' in the Sulu islands and away from the poverty in the Suluwesi Islands, all in the name of compassion.The kids go to school until standard 6 and so far a hospital visit is like rm5 at the outpatients clinic. They are able to earn a living peacefully. Even the Bajau Laut, living out in boats, on the coastal waters, are able to earn their living as fishermen.They chose to live on the boats and not to sent their children to school, contrary to what has been potrayed on the Western media.They have refugee documentation provided by the Malaysian government and many have set up their own businesses.Having lived in the West for most of my adult life,and working for several years in Borneo, I can see the difference in policy between the Western nations and Malaysia.Many Western nation will adopt a 'not in our backyard' policy when it comes to immigration. The same attitude is used with respect to the palm oil industry in Malaysia.We are giving jobs to those who otherwise would have no other means of supporting themselves-maybe those in the West would like to offer them jobs instead eh?Malaysia is 2/3 covered by forest still, can the same be said about the US? The orang utan are released back into virgin jungle, not killed.Australian farmers kill their rabbits and dont bat an eyelid over it? Just because rabbits are not endangered, does that mean that they can be killed and not released back in the wild? At the end of the day, its all double standard and the ignorance, arrogance and the selfishness of the West. Umpteen apologies for this belated reply - the old lady had a little health blip. 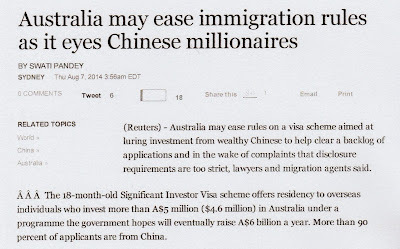 I have often mentioned or insinuated into my postings about how lucky Malaysians - Malays, Chinese and Indians - are. As we both have lived abroad, we are able to see the Malaysian and Western world from uncoloured glasses. Malaysia is the only country in the world where the proportion of the indigenous are almost at par with the immigrants (brought upon by the imperial authorities) - where the latter have the opportunity and freedom to prosper and keep their holdings (unlike in Vietnam for instance) and where the citizens are given a lot of rope to criticise and demonstrate against the authorities, the constitution and government policies. Of course Malaysia, like any other country has its warts and needs to clean up some its objectionable practices like corruption. But certainly the situation is not so bad that Malaysians have to rush on to rickety boats to seek for economic and political sanctuary overseas. Except maybe for the well-heeled and well-educated (all achieved while they were Malaysian nationals) who hop on into jumbo jets with the visas for their western destinations safely tucked in their briefcase and handbags. But I often wonder why these so-called 'diasporic' Malaysians gravitate to the wealthy West and avoid their Eastern 'blood' countries? PUSH or PULL? However I have to make this caveat ; sometimes the ones who remain in Malaysia are more vociferous in griping their dissatisfaction and discontent as they "memijak bumi dan langit' di Negara Ku' "
I forgot to thank you for the solid comment. Hope you are feeling better dear.As for me...this old foggie is trudging along :). It would take something to bring this geriatric down - the spirit is still willing though the flesh is a bit bolshie! You just keep on walking (not trudging please) !